I got positive feedback on my dishes, which I'm sure my new friends would have given me whether or not they were real successes. However, this particular side dish, yeongeun jorim, received multiple rave reviews and was snapped up by my guests so quickly that I knew I had hit the mark with this one. Though I usually don't have sweet dishes as part of the main meal, this side dish (반찬 / banchan) of chewy lotus coated with a sweet, sticky soy sauce glaze is actually a pretty fun contrast for flavor and texture when served as part of an array of Korean side dishes. I love how the saltiness of the soy sauce keeps the syrup from being cloying, and I've been enjoying this yeongeun jorim as a little snack when I am just craving something sweet! Yeongeun jorim (연근 조림) literally means "lotus root simmer." 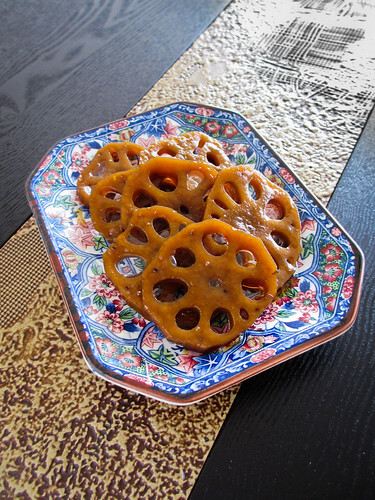 The word for lotus root, yeongeun/연근, comes from the Chinese 蓮根 (lián gēn), while jorim/조림 is a pure Korean word referring to something that has been simmered or stewed in soy sauce. Here I use a dark syrup made from rice malt, which yields a great depth of flavor, but you could substitute it with corn syrup in a pinch. During cooking, the water will evaporate, and by the end of cooking, remove the kelp and mushroom and continue reducing the sauce until it becomes a syrupy consistency. The lotus root is pretty forgiving, so it should be fine if you want to speed things up at the end and just boil the syrup down to finish it off. Remove from heat and gently stir in the sesame oil and garnish with sesame seeds. Cool to room temperature; store refrigerated.